RIP our Ziggy :'( | Life, Music and the Web… Revived! Since Ziggy was my first dog, i did not have a clue really on what to do. Well i might have done a ton of research about Pet care and what not but on actual i got nothing. During his first night here my wife said that we need to give him some bath and we did. I can remember how he was shivering from the cold and it looked like he could die in there and i was so worried i watched him sleep and put a blanket around him. He was really small back then as i can still remember how gently i did carried him and helped him settle in an old grocery packing box. The next day, I rushed to the city to buy Ziggy’s must haves, like a little wire cage, a couple of bowls, some dog food, some treats, a collar, a walking leash. He hated that wire cage. I put him there inside fearing that he might wander off our cycloned fence on the back of our house. He screamed and cried like crazy and i was worried the neighbours might throw some stones at us for public disturbance which gladly did not happen. I got some neighbours with high tolerance, me thinks. Then come Ziggy’s vaccination schedules, it was a horrible event for him as he hated riding on our car. I don’t know but he’s like having this strange thing what humans call “byahilo” or one where you get dizzy riding a moving vehicle and eventually puke. I put him inside that blue wire cage at the back of our minivan each time we went to see the vet for his shots. The vet was like 5km away from our place and on our journey Ziggy was cyring and screaming like crazy and when we arrive at the clinic and open the back of the van I would see little ziggy having some drool in his mouth and some puke spots in there. Luckily that cage came in with some tray at the bottom part use to catch your pets excretions. We did this thing like 3 times and we did complete his vaccines and anti-rabbies and I was so glad and relieved that the vaccination sessions are now over and he didn’t go through anything like that again. We had really some great bonding time together. Ziggy is a smart dog. I did not expect he was this highly trainable. I watched a couple of how-to videos in youtube and in a matter of minutes attempting ziggy to fetch a ball and he did learn it already. Some says it was built in in their instinct to retrieve, maybe they are right or maybe is just smarter than most dogs and he wanted to pleased me and help me not looking like an idiot throwing the ball and not getting anything in response. Many training sessions passed and he learned a lot of tricks, cool tricks i even made a video of them. I can clearly remember the tricks or commands he did. He got the basics like fetch, sit and down(lie down), stay. Some cool ones like bang-bang where he plays dead and lay on his back paws up in the air. “Through” were he get through my legs. “Speak” where he lets out a series of soft barks. “Wait/Eat” is a command i give him to wait for my cue to eat his treat i placed on top of his extended front paws. “Shake” was supposed to be a shakehand effect but it really looked like a high five. “Cross” is when his front paws. “Crawl” this trick he hadn’t perfected and i did not have this on video. He crawls on all four. He jumps up on the table too when i point on it and says up i’m not sure if it’s a trick though but it was cool he understood me. damn ziggy you we’re a smart one. I was lucky being able to see the things you did. Having Ziggy inside our home was not always that fun. A lot of times he was all destructive he would dig up on our yard and bite the grasses we planted on it. Our slippers he would bit them and carry them away from our door. Our trash can he would bite the black trash bag inside and topple it. The walls in our house was all muddy because he liked to rub his body on it after laying down in some muddy spot he dug. In short Ziggy brought us some problems. We needed to adjust and we did and we just accepted that it was his way and we hoped that one day he would just stop doing that. There’s also this issue when walking that i never will forget. Ziggy is constantly being attacked by way smaller dogs like Shi Tzus. There was this one time and i got an arnis stick and it was so coincidental that the moment I brought my arnis stick that this small dog attacked Ziggy. That dog wouldve regret attacking Ziggy as i gave her a good one the right of his belly. Sorry for being cruel but it’s not like that dog will die it was just enough that he will feel a little pain and that’s all was needed so she’ll learn to back off. The owner was there when i hit that and he blurted out like a loud “Ayaw” and it was too late as the stick already hit his dog and he quickly carried his dog away. I said nothing to them and just walked away but deep inside i was a little fuming for their irresponsibility of not securing an aggressive dog. Ziggy was never someone who liked to fight. He could of step on these little dogs and put his body weight on them and they would’ve no chance. I constantly tease Ziggy on how coward he was. Ok so ziggy grew big, really big and everyone in our place was like shock of seeing him grow very very fast. They commented on how quickly he grew to his size. Ziggy was really a large dog. So how did it end for Ziggy, well for all his vaccines it seemed like they did not keep Ziggy from contracting on what seemed a Parvovirus. It was really quick. Monday he was not his usual self, he’s not eating well and some loose stools with a little blood on it then tuesday he was really weak and refused to eat at all and he barely stood up. I researched up and parvo vaccines are only effective when your dog will make antibodies or immunity out of it and in Ziggy’s case it seems he did not. Seemed like he got some weak defense down there. The night before Ziggy died i kinda get the idea already that he’ll die. I was hurt, yeah. But i just think that whatever happened to Ziggy, God has a reason. Must it be a lesson? A punishment? a wakeup call? blessing in disguise? 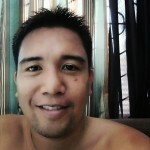 I don’t know but all i know is that I was not the Good me this past weeks and my wife can even atest to that. I would not dare question God’s plan or blame anyone. I could blame me for not getting Ziggy to the vet but with all honestly i am just a struggling family Man who make ends meet and spending a fortune on a vet clinic which he’ll still be 50/50 was not an option. So the next day, when i woke up ziggy was still alive but seemed like he can’t move anymore so i carried him to the back of our house so he can get a shade and not staying under the sun. I kinda knew that it was just a matter of time he was growing so weak by the hour. I checked him from time to time. I even wiped his eyes which have dirt accumulated in there which formed like tears dropping down. that broke my heart seeing my pet like that. I knew he was in a whole lot of pain so i kind of said to him “listen Ziggy, let it go now, you were really a good Dog and you have done a lot”. After an hour or so it was like 4pm on October 9th 2013th. If there’s a heaven for dogs you should be there by now. You we’re special Ziggy, thank you for the memories you brought us and thanks for teaching me a valuable lesson. 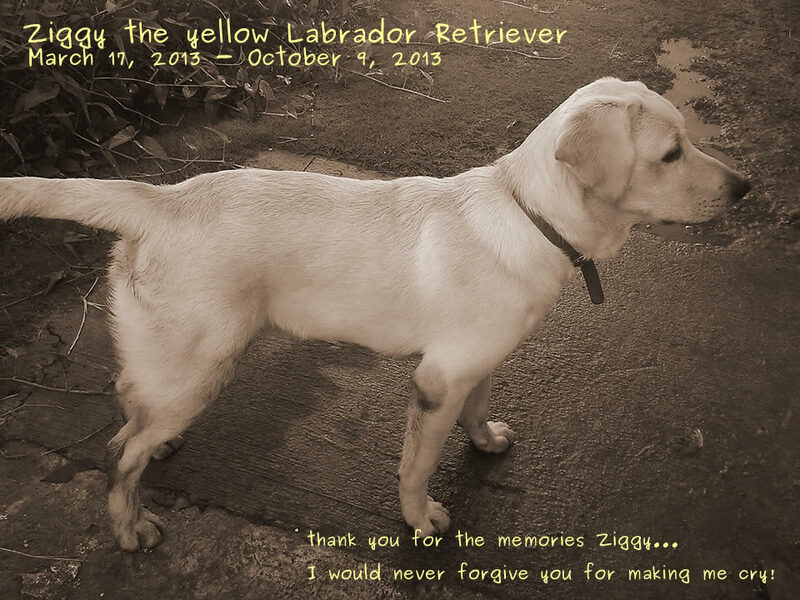 Ziggy was a Labrador Retriever named after Bob Marley’s son Ziggy Marley. Also in realtion with the movie “Marley and Me” and of course being me as a big Bob Marley and Reggae fan. PS: losing a pet is so hard and would seem to devastate you and i am decided of not getting another Pet or treating another dog as pet if anything it should purely be for guarding purposes.